Rajasthan is not only famous for its pink city Jaipur, desert, animal fair and the race of camel; but for high quality quilts too. They have always been in great demand because of the market value among the Indians and foreigners alike. On visiting Jaipur, one cannot stop buying quilts from here. In the market, various types of the quilts are available like AC quilts, micro quilts, light weighted quilts and silk printing quilts. Though, quilts in varied forms are available everywhere; but, there is no comparison between Rajasthani quilts and the others. In the normal course, the quilt is manufactured by making a bag of cloth, filled with made with cotton or poly wool for warmth in winter season. Certainly, Rajasthani quilts are made in the similar way. But, the fabric, its alluring printing style and the pattern embarked on it makes them appealing. Indeed, the quilts from Rajasthan resemble its colorful lifestyle and cultural presentation. The imprints of Rajasthani folk dance, royal palace, fortress, elephants and camels can be seen on the quilt covers. In fact, one can also check out hand painted quilts too. The expert artist paints the entire quilt cover with natural colors. Generally, it takes 1 to 2 months to prepare a quilt cover. It is the sheer hardwork of experts that lends exceptional touch to the quilts. The handmade knitted patches stitched on the quilt cover gives an exclusive look of the finally prepared quilt. At times, block printing is also done on the quilt’s cover. It is an art using man-made, vegetable and natural colors. The quilt prepared through block printing has a kind of style, which cannot be beaten by any machine printed style. Apart from this, “Tie and Dye” method is also used to print the quilt covers. In this method, the cloth is tied with thread in a unique way; then, it is dipped into the color. After removing thread, a wonderful design on cloth comes out. The silk printed fabric quilt has its own category of customers. Its softness and light weight protuberant style entices the people. In designing Rajasthani quilts, experts happen to use silk, cotton and even woolen fabrics. The most significant feature of Rajasthani quilt is its weight. In comparison to other traditional quilts, they are light weighted adding to its warm appeal. The price range may vary as per the work done on the quilt. No matter, what the price is; owning genuine Rajasthani quilts is always a pleasure. 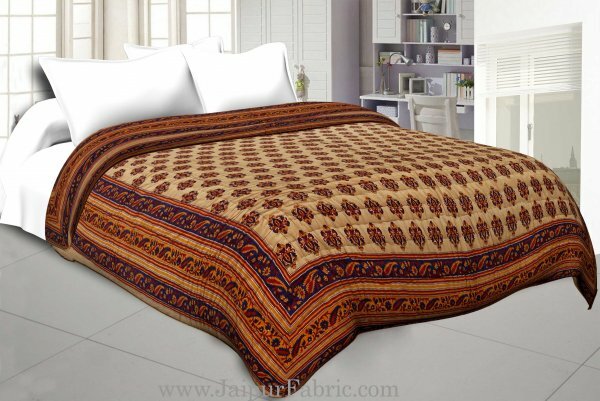 Rajasthani quilts have immense popularity among the people and Jaipur is the main market for them. 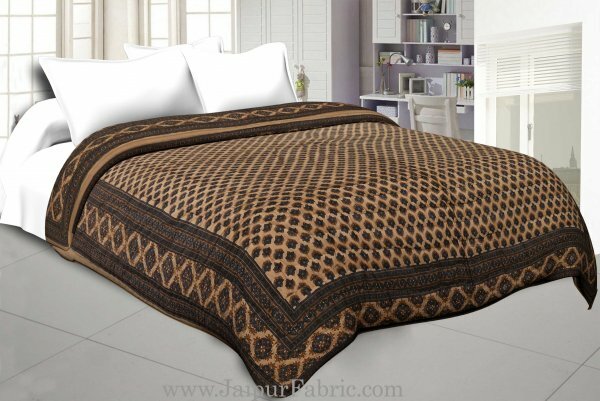 Now, the demand for Rajasthani quilts is increasing rapidly outside India also. It is stretching its market at the international level. The government is also supporting the Rajasthani quilt industry by giving export favor and tax reductions to develop the quilt industry. Definitely, Rajasthani quilts is the perfect example of traditional enthusiasm of Rajasthan.